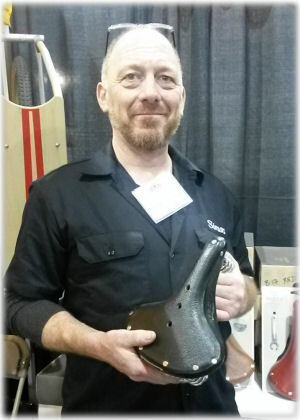 Simon Firth, of Transport cycles, Philadelphia, Pennsylvania, USA, Brooks authorized repair site. A rail on your Brooks leather saddle broke? Our new page lists repair sites around the world. Your repaired saddle will be better than new, because it is broken in. Photo: Simon Firth, of Transport cycles, Philadelphia, Pennsylvania, USA, authorized Brooks repair site. Do-it-yourself repair is also sometimes possible and we tell how. This entry was posted in New pages and tagged 17, b66, b72, beeswax, berthoud, bicycle, broken, Brooks, copper, foot, gilles, Idéale, leather, Lepper, Lexol, neat, oil, Pro, professional b17, Proofide, rail, repair, Rivet, saddle, saddle soap, saddles, seat, selle anatomica, shelbroco, Sheldon, Sheldon Brown, sheldonbrown, sheldonbrown.com, Swallow, Swift, team, tension, Velo Orange. Bookmark the permalink. Please check out the suppliers listed in the article at http://sheldonbrown.com/saddle-repair.html. We are the Web team at sheldonbrown.com/. I’m not Simon! You do best to order parts directly from a Brooks repair shop. Simon Firth works at one of these shops, in Philadelphia, Pennsylvania, USA.